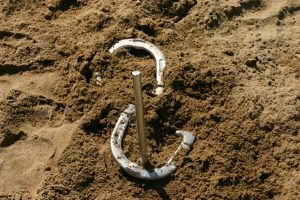 The Kewanee Horseshoe League meets every week starting the first Wednesday in May at Chautauqua Park in Kewanee, IL. The league is open to all players. Men aged 17-70 throw from 40 feet; men over 70, ladies and young players throw from 30 feet. The point system is 1 point for shoes within 6 inches of the stake and 3 points for ringers. Any player can show up at 6pm to be on a team and play will start at 6:30. Play takes place on clay courts and teams change weekly. The cost is $3.00 a night payable only when you play. The league pays back $2.00 weekly and $1.00 is held for the banquet at the end of the season. This is a loose league where players make it as often as they like and can start any week of the league. The league uses a 90% handicap but if you don’t have one, a temporary one for a players first night can be figured. Partnering is done by drawing cards. The top half players will draw a card and then the lower half players will draw. The cards that match up will be partners for that night. After partners are determined, the handicaps are added together to get a start score. The league plays 10 innings counting all points and the high score wins the game. On a normal league night, 4-5 games are played and everyone is generally done by 9:30pm. The league can have up to 24 players on any given night. The league directors are Warren Kieft, Marc Ouart and Tory Hernandez. If you have any questions or would like additional information, please contact Warren at 309-883-0930.